Ok, confession. I am not a huge plaid person. I have one plaid skirt that I bought years and years ago and one plaid shirt that I was a gift from years and years ago. I am not huge on plaid. Usually I feel like it is farmer jane(ish) or makes me look a little more shapely in some areas than I would hope. However, these plaids that Laurie and I have run across on Pinterest are quite lovely and desirable. My favs might be the poncho and the red and white jacket the girl with the perfect pony is wearing. But that scarf with leather and snaps (!!) that is pretty fabulous too. 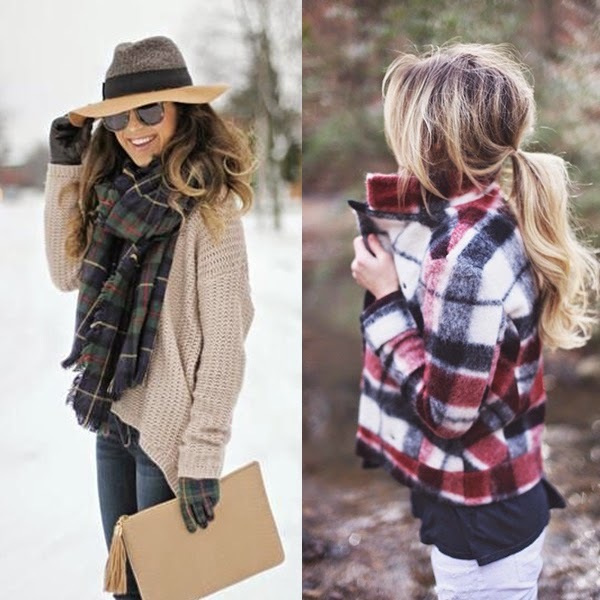 What is your favorite plaid of the season? P.S. Laurie and I are so excited it TGIF is here...we have been a slammed lately and I'm sure you can tell! We hope to catch up this weekend!